Add a stylish look to your fireplace while keeping your firewood organized with the Panacea Antique Iron Contemporary Log Bin. The round shape, lasting metal body, and wooden handles form a sturdy bin, perfectly enhancing your hearth. The textured and mottled, all metal frame ensures durability on the piece, and its gray tones mimic aged iron. The 13" base diameter has three metal feet, raising the unit slightly off the ground and allowing it to rest on virtually any level surface. The frame flares outward to hold a wealth of logs, and the open top keeps them easily accessible. Two handles allow you to reposition the bin in moments, while their wooden accents help your hands stay cool. 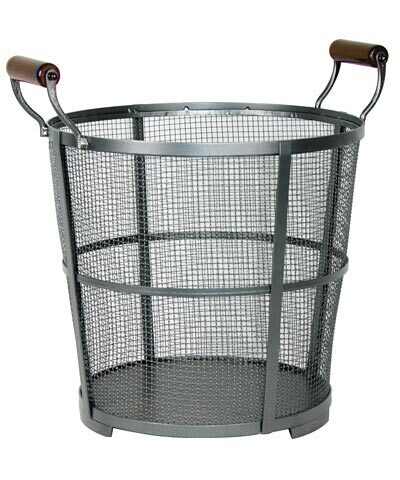 Keep your hearth tidy and sleek using this Antique Iron Contemporary Log Bin.